In college I was told that landscape painting is dead. I decided to reinvent that notion. 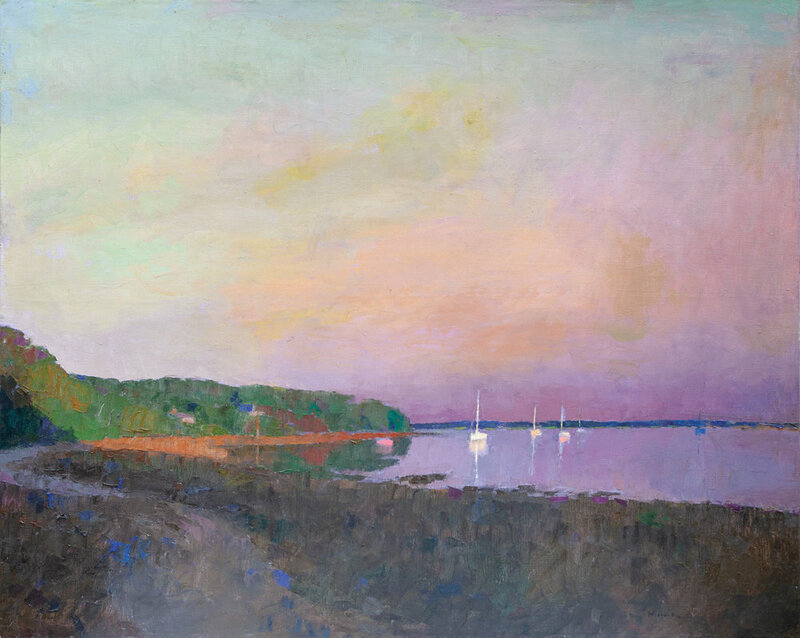 I took two uniquely American painting styles, The Hudson River School and Abstract Expressionism, put them in my artistic blender, and came up with something new—my perspective on the American Landscape. I was born in New York and raised in a typical American suburb. I attended public school and a state university for my art degree. I lived through and experienced the Cold War, John Glenn, Neil Armstrong’s walk on the moon, the space shuttle, the Vietnam War and the peace movement, rock and roll, and 9/11. These things percolate through my work like sweat coming out of my pores. My education is American. My teachers were: Gerald Fairclough, a Vietnam War artist; Isaac Soyer at the Art Student’s League; Nick Marsicano’s teaching of (Hans) Hoffman’s push/pull and Abstract Expressionism. I met and spent time in the studios of Wolf Kahn, Emily Mason, Irving Petlin, Willem DeKooning, and Jennifer Bartlett, among others. The United States does not have an ancient civilization with pyramids and coliseums. Barns and skyscrapers are America’s archeology. Traveling across the country, I paint them both, looking for recognizable motifs and hidden gems. When I travel across our borders to such countries as Iceland, Japan, Canada, Finland and Israel… I paint their landscapes through American eyes, unburdened by their culture and history. Autumn, oil on canvas, 39 x 31 in. Autumnal Reflections, oil on canvas, 28 x 79 in. Backyard by the Sea, oil on canvas, 35 x 46 in. Berkshire Barns in Snow, oil on canvas, 28 x 36 in. SOLD Forest Snow, oil on canvas, 18 x 24 in. Indigo Sky 2018, oil on canvas, 24 x 31 in. Island Farmhouse, oil on canvas, 57 x 79 in. Lake Calm, oil on canvas, 30 x 40 in. Quiet Pond, oil on canvas, 42 x 64 in. River, oil on canvas, 51 x 51 in. River Access, oil on canvas, 25 x 77 in. 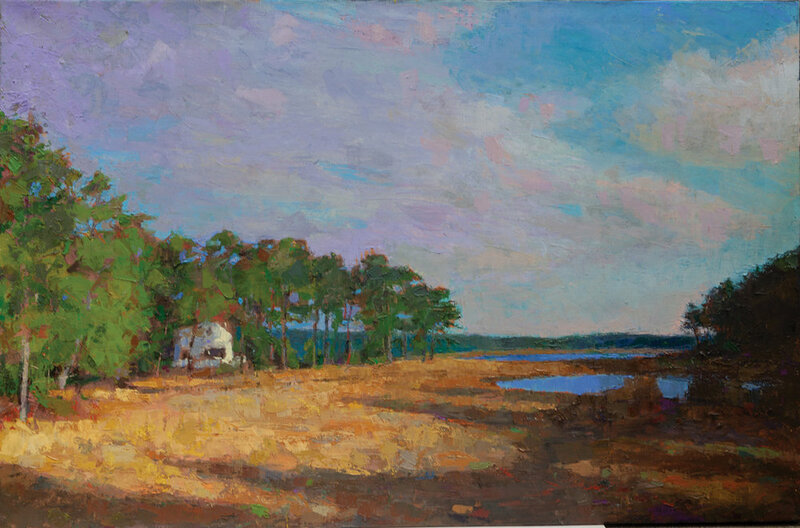 Secluded Marsh House, oil on canvas, 42 x 74 in. Shade Tree, oil on canvas, 51 x 51 in. Silent Cove, oil on canvas, 51 x 64 in. Storm Over the Bay, oil on canvas, 38 x 48 in. Sunset Waves, oil on canvas, 44 x 58 in. Bedford Path, pastel on paper, 30 x 40 in.